Pour rice (from Chicken Helper box) into 2-quart saucepan. Add 2 cups water. Heat just to boiling. 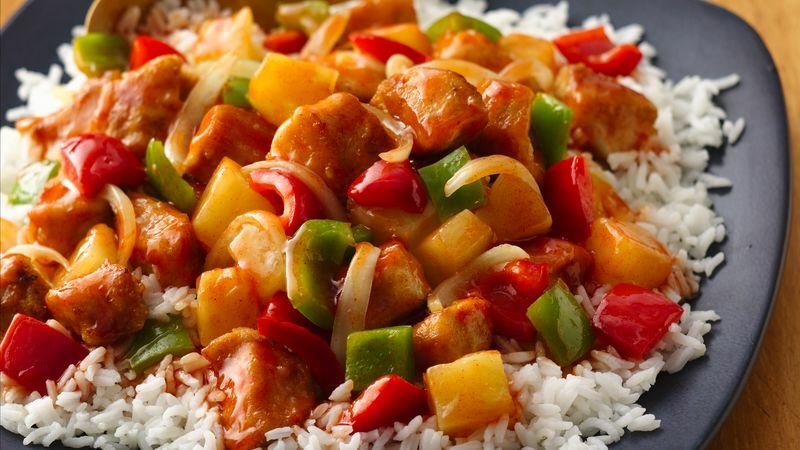 Reduce heat; cover and simmer about 20 minutes, without stirring, until rice is tender and liquid is absorbed. Meanwhile, cut chicken into 1-inch pieces; pat dry if necessary. Place chicken in medium bowl. Add seasoned coating (from Chicken Helper box); toss to coat. In 10-inch nonstick skillet, heat 1 tablespoon of the oil over medium-high heat. Add onion and bell peppers; cook 3 minutes, stirring frequently. Remove from skillet. In same skillet, heat remaining 2 tablespoons oil. Carefully add chicken; cook about 6 minutes, stirring occasionally, until deep golden brown on all sides. Carefully pour 1 1/4 cups hot water into skillet with chicken; stir in sauce mix (from Chicken Helper box). Return vegetables to skillet. Heat to boiling; reduce heat. Simmer uncovered 3 to 5 minutes, stirring occasionally, until sauce thickens and chicken is no longer pink in center. Stir in pineapple; heat until hot. Serve over rice. You can use either a whole red or green bell pepper instead of half of each color. Another time, add a touch of color with a yellow or orange bell pepper. Add a touch of crunch by topping with chow mein noodles or sliced almonds.